VATICAN CITY (CNS) — Christians have faith in a God who wants to and is able to transform the world, conquering evil with good, Pope Francis said. That is why “it makes sense to obey and abandon oneself” to God and his will, even during life’s most difficult moments, the pope said March 20 during his general audience in St. Peter’s Square. When people pray, “Thy will be done,” they are praying not as subservient “slaves” but as children who understand and trust their father and his loving plan, the pope said. Christians do not believe in random, unalterable or “inescapable fate,” the pope said. Rather, they truly believe “that God can and wants to transform reality, conquering evil with good,” and this, he said, is why people pray. Even though Christ was being “crushed by the evil of the world,” he abandoned himself fully and confidently to God’s will, the pope said. 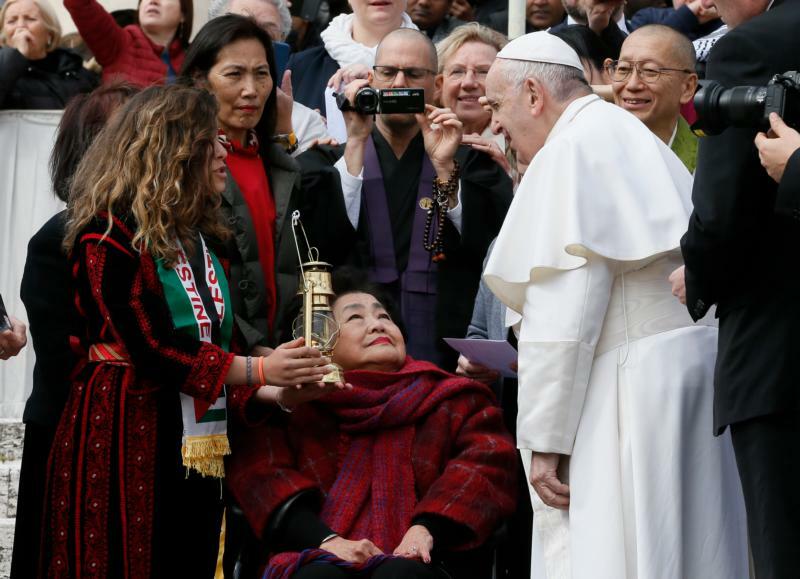 Present at the pope’s general audience was Nobel Peace Prize recipient, Setsuko Thurlow, 87, a Japanese-Canadian survivor of the United States’ atomic bombing of Hiroshima in 1945. She received the prize in 2017 on behalf of the International Campaign to Abolish Nuclear Weapons.